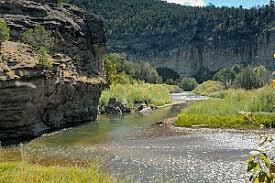 Offering the chance to catch brown and rainbow trout, the Pecos is one of the most accessible rivers in New Mexico. The main road runs much of the length of the river allowing anglers multiple access points. The Pecos is a medium sized river that is ideal for beginners but equally challenging for the experienced angler. A Minutes away from Albuquerque, the Pecos River offers a multitude of access points. Please contact us for more information. Fishing is fair using small nymphs and worms.